When I had my burst of energy last week (yes that was the last time it happened) I took a couple of photos of my latest WIP. Isn't it glorious? I love Noro colour changes but they can sometimes be a bit scratchy on the skin. Having this smooshy yarn from Countess Ablaze on the outside edges is going to make it a divinely soft scarf. I am pretty sure I'm going to be buying more of this yarn because is it is gorgeous to knit with and I know it will be wonderful to wear. 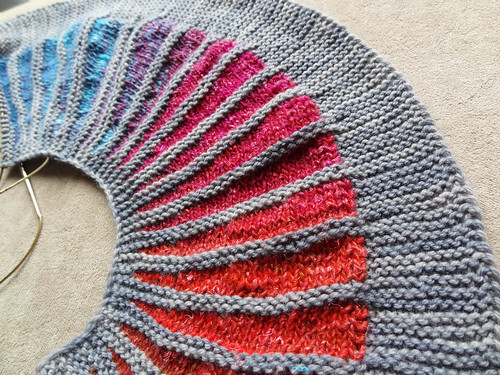 I love the subtle colour of the semi-solid as the contrast to the vivid colour changes of the Noro. This is how far I had progressed last week when I took the photo. I'm much further a long now. 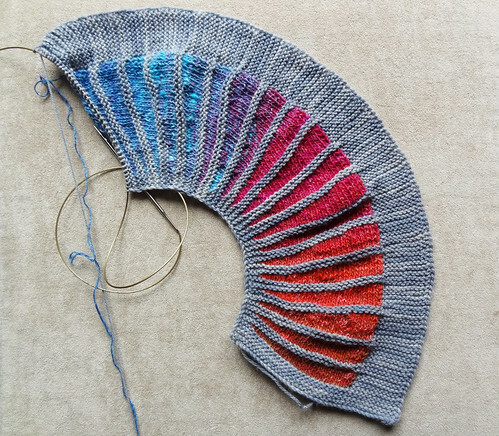 I'm enjoying this knit so much, as it is easy to memorise and the colour changes draw you along. You find yourself saying "just one more wedge". I think I want to keep this scarf. I really should find someone who wants it, but I love it too much to give away. That's all I've got to share this week, click the button and have a look at other people's photos as well!